Okay! Musume Time: It's Tribute Time! Join the Chuu! Sugoi! Idol! 'Sayashi Riho Graduation Tribute Plan' Before She Leaves! It's Tribute Time! Join the Chuu! Sugoi! Idol! 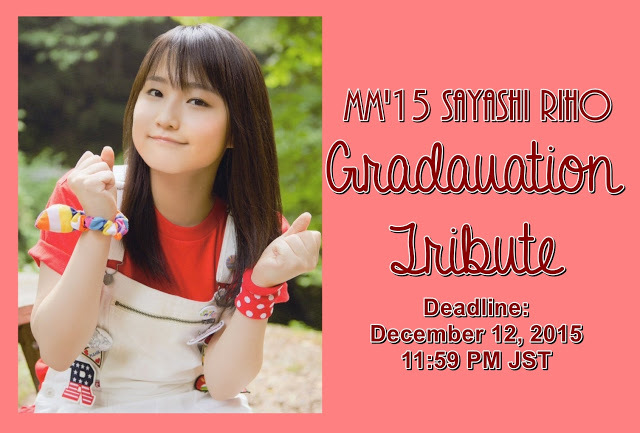 'Sayashi Riho Graduation Tribute Plan' Before She Leaves! On December 31st 2015, Sayashi Riho will graduate from Morning Musume '15 during the Hello! Project Countdown Live, breaking the hearts of her many fans as she does so. Of course, Riho will not be leaving Hello! Project itself, however her departure from the umbrella's flagship is one that has shocked many, myself included, for how sudden the announcement was, and how quickly she would leave after said announcement had been made. Like they have done in the past, the Idol blog collective that is Chuu! Sugoi! Idol! will be holding a special Graduation Tribute Plan for Sayashi Riho before she leaves Morning Musume '15 at the end of this year. The tribute will be all about the Western fans' undying love towards Riho, and to show everyone's support for her, all in the form of an amazing video that will be sent off to J-melo once completed! Choose whether you want to send in a Song Cover, a Dance Cover or a Photo Dedication, or all three! Both Song and Dance covers will be of MM's 9th generation debut song, Maji desu ka ska!!!! For both Song and Dance covers, C!S!I! have asked all participants to send J-pop singing samples and dance covers to their Hello! Project Fanpage. Dance covers can be new, pre-existing, and they can be done solo or in a group. For the song covers, however, they must be sung solo and acapella. Further regarding the song covers, C!S!I! are only choosing around 2~3 people to sing the song, and upon selecting these lucky few, will then ask for them to record the audio for Maji desu ka ska! and to also record a close-up video of them singing it. So, if you choose this option for the tribute plan, I wish you all luck! So, whichever you choose of these two, remember; send your videos and audio samples to Chuu! Sugoi! Idol's Hello! Project Fanpage on Facebook!!! For the Photo Dedication and Message portion of this tribute plan, fans can send in a photo of themselves wearing something red, whilst also doing the Ganbare! pose that Riho is holding in the photograph above. This can be done either solo or within a group of people. You can also write a message to go alongside the photo, though it is limited to 10 words or less. The message can be written in Japanese or English, and must also be as readable as possible! All photo and message entries are to be sent to either the Facebook fanpage, or the email address emceepurplemee@gmail.com, with the subject line 'SAYASHI RIHO GRADUATION TRIBUTE', and you must include your name and country! Chuu! Sugoi! Idol! have set the deadline for December 12th, 2015 at 11:59PM PST, so if you plan on getting in on this tribute, you better get crackin' and sending in those videos and photos, and of course, sending your love to Riho! This is an amazing thing to do if you love Riho and want to send her off with something special from the fans of the world, so if you can, be sure to take part and give Riho a lot of love to leave with! Make it special, make it big, make it amazing! I know you can do it, so please, join in and become a part of this great plan! For the original post and all of the information you will ever need for this great plan, be sure to check out Chuu! Sugoi! Idol! right now, and then send yo content in! That's all for now guys~ Until next time please take care, stay happy and healthy, and of course, LOVE THE IDOLS!!! Muah!